I have been so devilishly unfortunate as to be drafted the other day, and very scarce of funds just at present, (having been put to considerable expense by the death of a brother-in-law in Washington and the consequent necessities of his widow and children.) I avail myself of old intimacy to ask if you will be willing to play “Richard” for my benefit at Front Street Theatre on Saturday afternoon next, provided I can get the Theatre. I spoke to Kunkel last night, and he will give me an answer tomorrow. Necessity, only, John, induces me to make this request. Mary wishes to be particularly remembered. I trust you will favor me with an early reply, and oblige yours, as ever, in friendship. 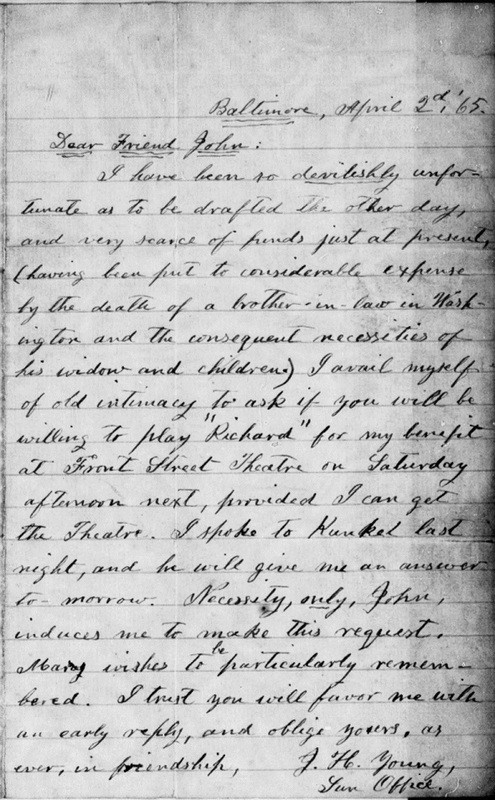 It is unlikely that Young went to war, seeing as Richmond fell and Lee surrendered to Grant shortly after this letter was written. While Booth did not perform a benefit for Young, this letter still presents a look at how well Booth was viewed by his acting peers. Young clearly thought Booth was a talented and popular enough actor to bring in a crowd, thus gaining him significant funds. In addition, Booth had a reputation for generosity which made him a likely candidate to help out a fellow thespian. Had his mind not been on other pursuits, it is probable that he would have come out of “retirement” to help Mr. Young. SO INTERESTING!! HOW I ENJOY NEW THINGS TO SEE AND READ ABOUT JWB. Very neat, Dave. If you have photos of anything else that was found in Booth’s trunk, I’d love to see them. Everything that follows this (up to page 420) comes from Booth’s papers from the National. Have fun! As to why theater owners did them, I can only hypothesize. I would think it would help them attract high profile talent by offering their stars money making benefits. Star actors may be willing to perform for less during a run if they think they’ll be able to recoup the losses with a benefit. Just my ideas. And, yes, “Our American Cousin” was supposed to be Laura Keene’s money making benefit. I wonder if she ever did get the box office proceeds from that night. Dumb question regarding the use of the word “drafted”. This late into the war the all indications was nothing less than a union victory, would they still be drafting for the army? Or possibly was Young referring to a financial situation?